First, there’s Nick O’Donnell the penalty stopper. Right before the penalty shootout to decide who would take home the 2015 UFL Cup, Kaya midfielder Carlo Liay went up to goalkeeper Nick O’Donnell and offered perhaps the most encouraging words to his longtime teammate in the junior national team, Ateneo, and Kaya: “Dude, you got this. This is your thing." The six-foot-two O’Donnell has made a name for himself as a penalty stopper and a championship winner. And he put that to the test on Friday night and delivered in a most spectacular manner. Backtracking first, during the Ateneo Men’s Football Team’s improbable run to the 2012-13 UAAP Men’s Football Championship, O’Donnell alternated with Yu Murayama at goal. Come, the Final Four, Nick was handed the starting job while Yu was placed at forward in place of striker Jacobo Lorenzo who got injured. Lorenzo previously played for Kaya. From the Final Four (against La Salle) to the Finals (a best-of-three affair), Ateneo won all three matches via penalty shootout with O’Donnell at goal. This UFL Cup, O’Donnell alternated with Matt Silva before taking charge come the Round of 16. In Kaya’s last two matches, they defeated Stallion and Ceres both via… a penalty shootout. When O’Donnell minded the net for Ateneo in 2012-13, it broke a seven-year drought for the Blue Booters. With O’Donnell at goal for Kaya, it ended a six-year title drought. Said O’Donnell: Looking back now, it’s remarkable when you compare the two championships. It’s absolutely extraordinary. When you compare the stories and the routes to the titles, it’s amazing. Both teams (Ateneo and Kaya) had to face great adversity and overcome huge obstacles. Both teams went into the finals missing key players due to suspension or injury. Both teams struggled in the previous seasons and have been on championship droughts. Both teams had to beat rivals who normally had our number. Both teams won their respective championship titles through semi-finals and final game penalty shootouts. In short, a feeling of deja vu definitely. There is only one holdover from the last Kaya UFL league champs in 2009 — Aly Borromeo The longest-tenured Kaya player is also the last man standing for Kaya. Aly came on as a late substitute in UFL Cup Finals against Ceres and even converted on his chance during the PK shootout. And lastly, both Ceres and Kaya featured a few players who suited up for the other side at one point in their career. Kaya had three — Jovin Bedick and Janrick Soriano who suited up for Ceres’ U-23 team and Joshua Beloya. Ceres had Jason Sabio and Nate Burkey although both were on the bench for the match. The 2009 and 2015 Kaya champs both went undefeated. When Kaya won the UFL in 2009 under head coach Mikee Carrion, they swept the league, 13-0. 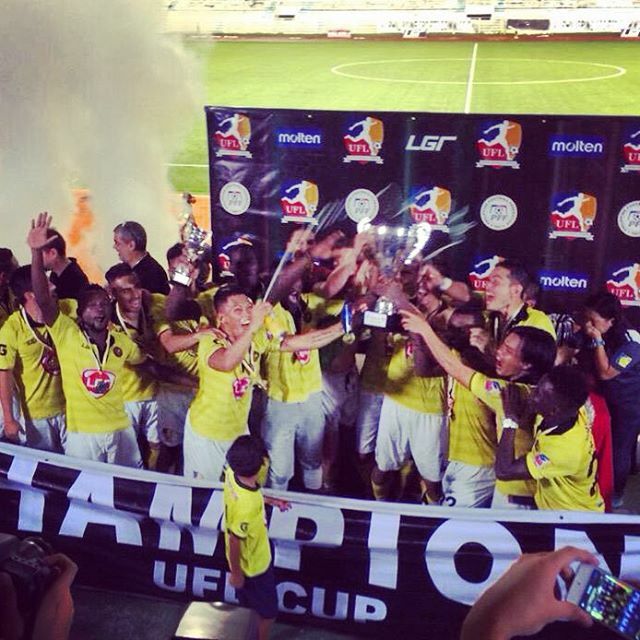 In their historic Cup win, Kaya finished as well with an immaculate slate, 8-0.